“Beston and The Kitchen” is simply a document of the raw energy and excitement that a live band of serious musicians can produce. This is rock’n’roll spinning on its head: Beston and his dizzy crew take the hip-hop form and fling it in a dozen directions: over the favelas of Brazil, past the Mississippi Delta, to the docks of the Caribbean, and into Motor City via San Diego. And through the whole journey Gabe and Jano are wailing on their drums like banshees, Steph and Marnie are crooning like songbirds, and Joe is pounding out the bass like Vulcan at his anvil. Beston, out in front with guitars akimbo and mike strapped to his shaved noggin, is thumping truth like a brimstone preacher and generally talking too fast for his own good. What it boils down to: all-new, all-original, good fun. 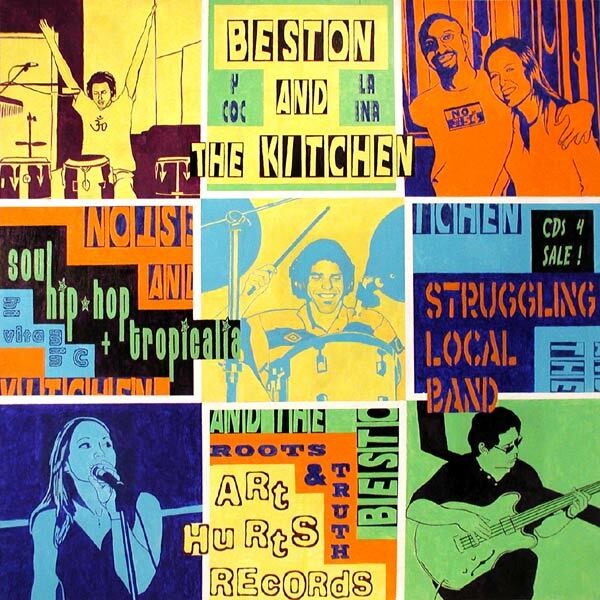 Categories: album, Beston and the Kitchen (2003) | Permalink.